I can’t recall a production of Jerry Bock and Sheldon Harnick’s classic musical that didn’t send me scrambling for synonyms of “charming” and “delightful,” and this one -- the second from the Roundabout and from director Scott Ellis -- is no exception..
With exceptionally fine leads, a scrumptious jewel box set (by David Rockwell), an irresistible book and that beloved score, this one, like the last, has everything going for it..
Based on Hungarian playwright Miklos Laszlos’ 1937 play “Illatszertár” ( “Parfumerie”), famously filmed by Ernst Lubitsch as “The Shop Around the Corner”in Hollywood three years later, turning up again as the Judy Garland-Van Johnson musical “In the Good Old Summertime” in 1949 (not to mention the 1998 updated Tom Hanks-Meg Ryan “You’ve Got Mail”), the plot concerns the sparring relationship of clerks Georg (Zachary Levi) and Amalia (Laura Benanti) in a Budapest perfume shop, neither of them realizing that the other is the pen pal with whom they’ve been corresponding through a lonelyhearts club. The proprietor of the shop, Mr. Maraczek (a rather miscast Byron Jennings, fine actor though he is) begins to mistreat his trusted employee Georg for mysterious reasons that don’t come to light till the second act. The other major characters are nebbishy clerk Ladislav (Michael McGrath), lovelorn Ilona (Jane Krakowski), the smarmy ladies man Steven Kodaly (Gavin Creel) with whom Ilona is having an illicit affair, and the likably ambitious messenger boy Arpad (Nicholas Barasch). For all the delicacy and European charm which Bock and Harnick and Masteroff have imbued their creation, the property has always had a distinctly Americanized feel. It’s significant that the 1994 London revival dispensed with the textual revisions of the first West End production, and played it American, accents and all. 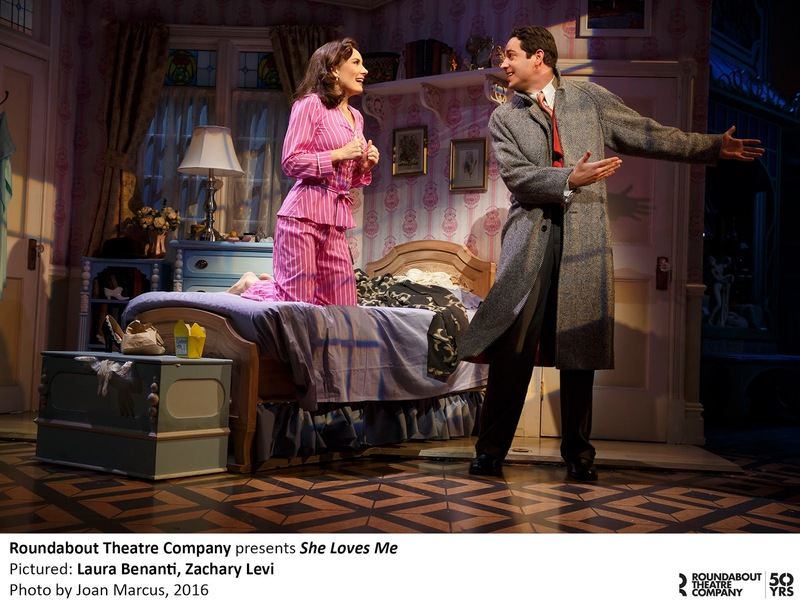 Inevitably, some of the gravitas and texture of the original has been lost, but “She Loves Me” still has a rare grace and elegance for a Broadway musical. The cast is terrific.Levi, so excellent in the underrated “First Date,” makes a winning Georg, culminating in his rapturous account of the title song. And Benanti is a marvel, alternately funny and poignant, and singing those songs so indelibly linked to creator Barbara Cook like “Will He Like Me?” and “Ice Cream” with comparably beautiful tone and impressive high notes.Their scenes together have all the requisite spark, too..
Krakowski continues to amaze as a superb comedienne and all around performer. Her reading of “A Trip to the Library” is cannily delivered, and she finds altogether fresh nuances in those familiar, surefire lyrics. Her dancing, including a split that, in its way, is almost as impressive as her high flying, upside-down rendition of “A Phone Call from the Vatican” in Roundabout’s “Nine” revival, is a marvel. Creel, too, is very fine indeed, smoothly vocalizing on “Ilona” and his final kiss-off number, “Grand Knowing You.”. 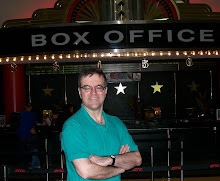 McGrath continues to impress as one of Broadway’s most rock solid reliable musical performers and funnymen. 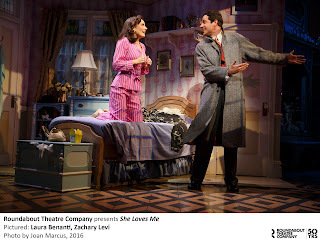 Warren Carlyle choreographs the proceedings with style, particularly the business around “A Romantic Atmosphere” performed in the cafe where Amalia waits forlornly for her “Dear Friend” correspondent. Peter Bartlett is the maitre d’ in this rather protracted sequence, a gem of a comic performance. Musical director Paul Gemignani leads his forces in Larry Hochman’s orchestrations with customary authority, the orchestra positioned, as per usual at the Studio 54 venue, on boxes on either side. If I could leave for NYC today, this is the show I'd try to get a ticket to! What a lovely review! Hope all is well in Harry's Broadway (and off stage) world! Happy Easter!